This is my semi-weekly feature highlighting a new album (album of the week) and an album that might be new to you or that I am enjoying reconnecting with. I am highlighting two very different albums this week. 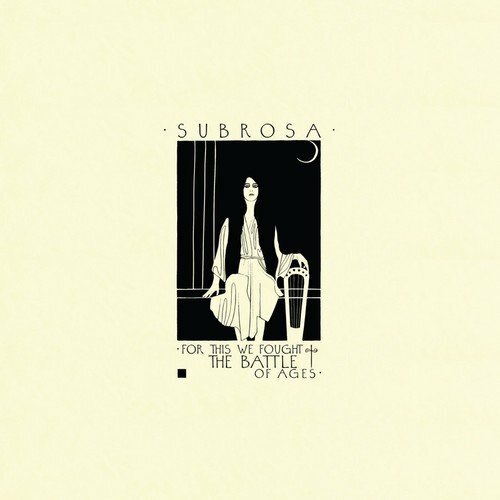 SUBROSA's excellent "For This We Fought The Battle of the Ages" and in honor of its 15th Anniversary New Order's "Get Ready." As a special bonus, since "333" by Against Me was voted the most popular song on my "Cold Maniac Maps" #Spotify playlist last week, and they just released the video, I figured I would include it too. The new Against Me album "Shapeshift With Me" is available for preorder now. Two asides, the video was directed by Ione Skye (Say Anything) and stars Natasha Lyonne (Orange is the New Black). It is rare I am into gloom-metal or drudge rock. But this SUBROSA album is really quite good. I know absolutely nothing about this band, but I saw a plug for it and started listening and was totally absorbed from start to finish. I would strongly recommend listening to it as one long experience, this is truly an album, not a collection of singles (it has an arc). Given that there were other albums that I liked this week (Angel Olsen's "My Woman" comes to mind) I liked this one a great deal. Give it a spin and if you like it, share it! I am a lifelong New Order fan. Hold on, let me clarify that. I am a fan of New Order (Bernard Sumner, Peter Hook, Stephen Morris, and Gillian Gilbert) not any version of the band without Peter Hook. This may seem petty, and everything might ultimately be Peter Hook's fault, but his bass playing IMHO is the literal backbone of post-punk. No Peter Hook, no New Order. This feud between Peter and Bernard has gotten so deep it has spawned competing books from both of them describing the history fo the band. Anyway, after a hiatus, New Order resurfaced (with Hooky) in 2001 with this gem. I remember playing this CD to death in my car (we used to play CD's in our cars, I know, pretty odd). Lots of high points and very few duds on a comeback for a 20-year-old band. I saw an article about it being the 15th anniversary of the release of "Get Ready," and listened again for the first time in a few years. Still holds up pretty well! Well, that is the end of another "Have You Heard This (Yet)? What did you think of SUBROSA? What is your favorite New Order album? Song? Who do you think deserves to be in the Rock and Roll HOF this year?